Sequential Networks presents an unbeatable leased line in Manchester that provides outstanding quality. Our leased line in Manchester delivers high-quality results to provide you access to your own tailored line solution. Our state of the art infrastructure allows us to maintain our excellent service to our Manchester line. We provide full connectivity solutions to businesses that need to expand their IT & Communications infrastructure. 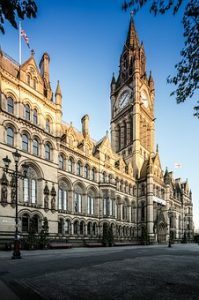 Our unique access to the best UK infrastructure makes us a top choice for a leased line in Manchester. The dark fibre network we provide offers excellent reliability and resilient. The goal is to provide a package that allows your business to soar with the aid of super-fast and reliable internet that has superior connectivity and superior communications performance. The significance of leased lines only continues to grow. Global IP traffic has increased massively as a result of business growth. Businesses require more data than ever. A leased line gives your business room to breathe and expand. 1GB download speeds may have been the elite standard; however, these speeds are now quickly being seen as too slow to cope with modern demands. Businesses with a large number of employees or large amounts of data have to transfer copious amounts of it a day. Our business broadband services are built for the future to allow them to expand. A leased line offers the chance for your business to fully thrive. Additionally, the importance of graphics and video content is only increasing. These factors result in the requirement of a 10GB line to remain ahead of the competition. A seasonal spike can usually be good for a business; however, their leased line needs to be robust and fast enough to handle the extra demand. Sequential Networks are determined to allow your business to fulfil its full potential through our state of the art leased Manchester Line. Our lines can cope with your changing business needs, and we are dedicated to finding the optimal solution that is tailored towards the fast-changing requirements of your growing business. Our leased line is future proof so you can easily plan ahead with added reassurance. Sequential Networks are dedicating to providing complete coverage to suit your entire business needs. This includes a wide range of IT and telecommunications technologies. We have your entire business technology infrastructure covered. We provide a leased line, a UC, SIP Cloud as well as full VOIP solutions. Additionally, we offer flexible types of Ethernet technology to suit your business. Why risk multiple mediocre services, when you can have a complete connectivity solution provided by a company that values quality and customer satisfaction above all. Outsourcing may be a trend, but we are proud of our company to be English, and this is reflected in our customer support team. We are proudly registered in England, and it is where we offer all of our products and services. We have UK dedicated servers that are ready for instant deployment. We create them, own them and maintain them. The lack of a middleman means you can expect the same high-quality, reliable service for the entire time. Our service level agreements merely underline our commitment towards providing high quality and transparent solutions that are tailored for every business. Our 99.99% SLE means you can have assurance and peace of mind. Our support team shares our vision and values. They are on hand to offer you quality assistance whenever you may need it. All of our clients have instant access to our customer service team around the clock, 24 hours a day, every single day of the year. That is our promise. They are friendly, and able to answer any concerns that you may have, no matter how complex or basic they are. Manchester has historically been a hub of innovation and a place where new ideas turn into practical businesses. We share this Northern ethos, and it is present within all of our services. A wireless leased line can be the extra component that your business needs to flourish. Connectivity allows businesses to work more efficiently and to achieve better results. Could your Manchester business be next in line to be superpowered by our world-class connectivity solutions?